Reverses door automatically if obstructed when going down, stops if obstructed when going up. Manual release in case of power failure. When power is restored, a push of the button automatically reconnects the door and operator. Industrial-strength heavy-duty steel "I-beam configuration for increased rigidity for 8', 10', 12' and 14' door heights, Full #48 chain drive. Projects an invisible light Learn across garage door opening. If anything interrupts the beam while the door Is closing, door automatically reverses before making contact, if beam Is obstructed, door will not close. Momentary contact to open and close. Standard with 14' rail.. Optional on all other door sizes. Provides additional roll support on 14' doors. 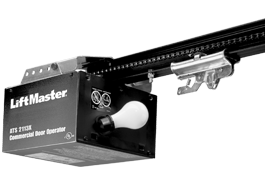 High-torque, industrial 1/2 HP, 115V, single-phase motor with instant revere and automatic reset thermal overload. 100-billion codes, never to be repeated. Entry System. Ideal for multiple drivers.